It took two years to completely renovate the Laguna Beach Motor Inn, and now Korakia’s new sister property in Laguna Beach, Hotel Joaquin debuted as a 22-room boutique hotel designed by Studio Robert McKinley who drew inspiration from St. Barts, the 1950s Southern California beach culture, and the Mediterranean coast. 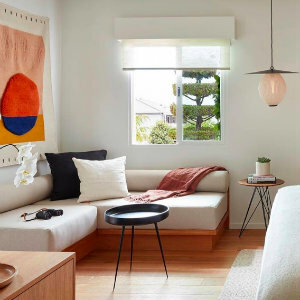 No two rooms are alike and you can choose your room by floor plan, ocean or garden view, and enjoy the thoughtfully curated one-of-a-kind vintage pieces, customized furniture, record players and curated artwork. Luxurious bathrooms feature monolithic imported stone, hand-cut and crafted tile and solid brass fixtures. Hotel Joaquin is not a place to take the kids, it’s an adults only hotel. 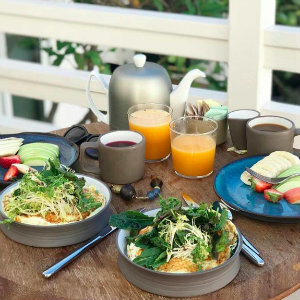 IThere are great touches like a welcome cocktail, Le Lano products, and guests have access to an array of complimentary adventure gear such as surfboards, hiking and diving gear, bicycles, kayaks and paddle boards. Need to find your bliss? There’s a Wellness Center at Hotel Joaquin that offers ancient ayurvedic technics, hot stones, and traditional massage and facial treatments. And, its chic restaurant, Salina, serves up sea-inspired dishes by Chef Leo Bongarra for breakfast through dinner. They’ll even pack up a picnic for you to take with you to the beach. Highlights from the menu include a Moroccan spread coconut flatbread, black beans, roasted red pepper, pistachios; Avocado Confit with pickled eggplant, flaxseeds, dehydrated kale; Quin Sea Bisque with arctic char, dry morels, parsnips; and Crab gnocchi with aged cheddar, gouda, macadamia, broccolini flower. The hotel is just a two-minute walk from Shaw's Cove, and for more water fun, there's also a pool with double daybeds, and drink and food service. Hotel Joaquin is offering a special mid-week rate ranging from $176 to $339, and weekend $272 to $429 depending on your room. Visit hoteljoaquin.com, emailing us at info@hoteljoaquin.com or calling 949.494.5294. 985 North Coast Highway in Laguna Beach.